What are the most popular online bachelor's degrees offered in Alaska? Alaska, the largest and most sparsely populated state in the U.S., incorporated technology into their education system decades ago. Since 1981, the state has utilized the Alaska Society of Technology in Education (ASTE) to promote access to technology for all students in Alaska. One of the best online colleges in Alaska is provided through the University of Alaska. This large, multi-campus university offers 106 online degree programs and counting. This university, like others in Alaska, facilitates online courses with the Blackboard learning management system. Many other schools in Alaska are encouraged to use this system, which creates a strong and streamlined online learning infrastructure across the state. Another source of regulation and compliance to online education standards comes from Alaska's membership in the Western Interstate Commission for Higher Education. The state joined in 1955 and since then has participated in the State Authorization Reciprocity Agreement (SARA). In doing so, Alaska demonstrated a commitment to making online education courses more accessible to students across state lines, in turn making online education a valuable and pragmatic option for students in Alaska. The University of Alaska Southeast (UAS) is headquartered in Juneau with extended campuses in Sitka and Ketchikan. Through its School of Arts and Sciences, School of Career and Technical Education, and its oversight of the system wide Alaska College of Education, UAS accommodates approximately 3,000 students with programming in a diverse range of disciplines. UAS, one of Alaska’s online colleges, provides students with access to a variety of academic programs and career and technical education via e-learning. Bachelor’s degrees are offered online in education, social science, business administration, and library arts. Of note is the BA in Social Science which has several concentrations, including history, political science, and psychology. The school uses a blend of e-learning delivery systems, including web, satellite broadcast, audio, or video conference. The school has a full complement of student services for online learners, such as admission counseling, faculty advising, UA site coordinators, tutoring resources, and online library resources. The University of Alaska Fairbanks (UAF) is a public research university and a flagship campus of the UA system, with seven rural and urban campuses and online learning. UAF, with the beautiful last frontier as its backyard, serves about 11,000 students with its catalog of online offerings spanning the disciplines; the most popular undergraduate majors include general program/studies, biological sciences, petroleum engineering, and mechanical engineering. UAF is one of the best online colleges in Alaska because of its extensive list of online bachelor’s degree offerings; these include the fields of accounting, business administration, education, interdisciplinary studies, and social work. Programs of note include the BA in Justice, in which students learn problem-solving conflicts regarding federal, state, and Native American issues; and the BA in Rural Development, in which students gain knowledge about the state’s cultural heritage, contribution to the global economy, and sustainable development strategies. Tucked away on 175 acres in the forest among Anchorage’s trail system, is Alaska Pacific University (APU), a small private liberal arts and sciences university emphasizing experiential, hands-on instruction. Among its notables are academic rigor, applied research projects, developing students critical thinking and problem-solving skills, and student engagement. APU has fewer than 800 students and is one of the online colleges in Alaska offering bachelor’s degree options: an accelerated BA to MBA and the BA in Counselling Psychology. Of note is their Accelerated MBA, in which students move directly from the BA program directly into the MBA, and classes can be taken entirely online. The school is affordable having implemented a 34% reduction in undergraduate tuition in a bid to ease student debt. Pell-eligible students can attend APU for free or at a much reduced tuition. Over the past five years, four-year college tuition in Alaska has risen by 30.1%, though tuition rates are still relatively low. State spending on education is up, and with more and more postsecondary institutions now offering online courses, now is a great time to pursue an online degree through an Alaskan college. 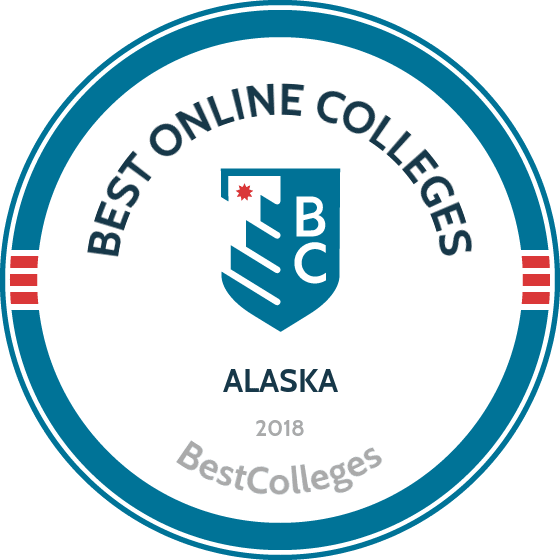 Browse our list of the best online colleges in Alaska for more insight into distance learning programs in this state. According to a recent NCES report, 16.4% of students enrolled in Title IV institutions in Alaska (5,553 students) were in exclusively online programs. One of only two states to increase public spending on higher education since the economic downturn in 2008, Alaska has invested significantly in distance learning programs. Many Alaska natives are familiar with online learning, as the sheer size of the state requires plenty of students to take distance courses. As online programs become a more prominent part of higher education in general, students in Alaska should expect to see schools in their state continue to develop their own programs. Already, the University of Alaska offers 112 distance-learning degrees, and many other schools offer some form of online education as well. In Alaska, employment growth in this profession is poor. According to the Alaska Department of Labor and Workforce Development, long term projections show a decrease of 30% in the total number of jobs between 2014 and 2024. Wages increased by 15% from 2011-2016. In Alaska, what were the top careers in 2016 for people who had a degree in business administration and management? Data source: Alaska Department of Labor and Workforce Development, Bureau of Labor Statistics. Data may not be available for every year. Employment growth in this profession in Alaska is poor. According to the Alaska Department of Labor and Workforce Development, long term projections show a decrease of 20% in the total number of jobs between 2014 and 2024. Wages increased by 1% from 2011-2016. In Alaska, what were the top careers in 2016 for people who had a degree in elementary education and teaching? Employment growth in this profession in Alaska is poor. According to the Alaska Department of Labor and Workforce Development, long term projections show a decrease of 40% in the total number of jobs between 2014 and 2024. Wages increased by 18% from 2011-2016. In Alaska, what were the top careers in 2016 for people who had a degree in special education and teaching? In Alaska, employment growth in this profession is poor. According to the Alaska Department of Labor and Workforce Development, long term projections show a decrease of 24% in the total number of jobs between 2014 and 2024. Wages increased by 16% from 2011-2016. In Alaska, what were the top careers in 2016 for people who had a degree in accounting and business/management? No schools in Alaska currently offer an online degree program in business or management.